Today I saw a sign of autumn and heard it’s sweet song. 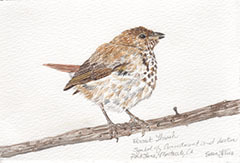 The Hermit Thrush has several legends but my favorite recalls the elegy that Walt Whitman wrote for Abraham Lincoln, When Lilac’s Last in the Dooryard Bloom’d. The Hermit Thush,who has such a beautiful song, was meant to be a symbol of the American voice. Burroughs wrote, “I pause reverently as the hush and stillness of the twilight come upon the woods…. And as the Hermit’s evening hymn goes up from the deep solitude below me, I experience that serene exaltation of sentiment of which music, literature, and religion are but faint types and symbols” I saw my first Hermit Thrush of the season as I embarked on my morning yoga practice followed by prayer. Here he is, tail tipped and beak pursed in perfect placement to create just the right note.